[Free Pattern] This Is By Far The Fastest And Easiest Baby Blanket You'll Ever Make! Homepage » Crochet For Baby & Children » Baby Blankets » [Free Crochet Patterns] This Is By Far The Fastest And Easiest Crochet Baby Blanket You’ll Ever Make! [Free Pattern] World’s Easiest Ripple! [Free Pattern] This Little Crocheted Top Is Amazing! This is a beginner-friendly crochet baby blanket pattern that’s easy enough for anyone to make. Despite the skill-level rating of “beginner,” I’m hoping that this pattern will appeal to crocheters of varying skill levels; if you ever need to whip up a new blanket in a hurry, this is a great pattern to have in your stash. Light Weight Baby Yarn: The yarn I used is Bernat Softee baby yarn. 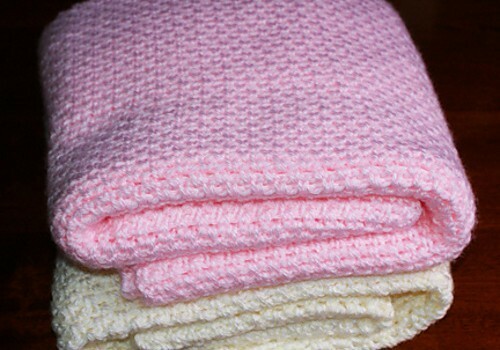 I made sample blankets in a couple of different colors.My preemie-sized sample was crocheted using the color called “Pink,” which is perfect for a baby girl. My newborn-sized blanket was crocheted using the “Antique White” color, which works well for either baby boys or girls. Feel free to use a different color; if crocheted in a boy-friendly color, this blanket would also be ideal for baby boys. If you aren’t sure of the baby’s gender, pick a neutral color that could work either way — the mint green color would be a nice choice, as would the white color. For best results, make sure all skeins are from the same dye lot.This yarn is rated as a “3” on the Craft Yarn Council’s yarn weight system. This weight is also known as “light worsted,” “DK,” or “Double Knitting.” According to the yarn label, the manufacturer also labels it as “Sport DK,” “Tricot Léger,” and “Jersey Ligero.”Preemie Size: My sample blanket measures about 26 inches wide by 34 inches long. This measurement was taken without any edging; if you wish to add an edging, your finished blanket will be a bit bigger.You will need 2 balls / 10 oz / 280 g of yarn for the blanket itself, plus more for crocheting your gauge swatch. So if you crochet your blanket using Bernat Softee, you’ll need to get 3 5 oz skeins of yarn. See pictures of the pink crochet baby blanket for an example of how this blanket looks.As far as yardage goes, you’ll need about 724 yards / 662 meters for the blanket itself, plus more for your gauge swatch.Newborn / Receiving Blanket Size: My sample blanket is 30 inches square. You could make yours a bit longer — around 34 inches long — if you prefer.You will need 2-3 of the 5 oz balls of Bernat Softee for this size. My sample blanket measures about 30 inches square, and I used exactly two balls with none left over. If you’d like to work a gauge swatch, or make your blanket longer, you’ll need a third ball of this yarn.Toddler Size: Finished size is about 36 inches by 44 inches. I estimate that you’ll need 4 of the 5 oz balls of Bernat Softee to crochet this size. Crochet Hook: I used a size I crochet hook to make my sample baby blankets. You might need a different size hook to achieve the correct gauge. Tapestry Needle: You’ll use this for weaving in ends when you are finished crocheting your blanket. Safety Pin: You’ll need a stitch marker or safety pin for temporarily marking a stitch at the beginning of your work. Thanks to Amy Solovay for this article inspiration and featured image. 1,331 Comments to [Free Crochet Patterns] This Is By Far The Fastest And Easiest Crochet Baby Blanket You’ll Ever Make! Where did you find the pattern? 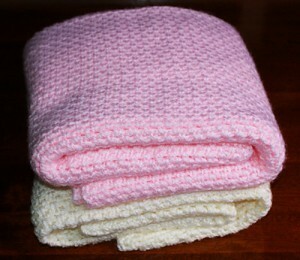 Susan, please click on the words: “Fast Easy Baby Blanket” to get to the pattern’s page. Hope this helps! On the 2nd page under all the writing is a section that says Get the FULL WRITTEN PATTERN for this Fast Easy Crochet Baby Blanket pattern with all the directions at: About…You have to read to and follow the link it gives you…..
Get the FULL WRITTEN PATTERN for this Fast Easy Crochet Baby Blanket pattern with all the directions at: About. Click on the highlighted About. Near the bottom in large print it says Get the FULL WRITTEN PATTERN for this Fast Easy Crochet Baby Blanket pattern with all the directions at: About Click on the link for About. @[100008307705814:2048:Peggy Burden] and @[1774262263:2048:Deb Barnett], where is says “This Fast Easy Baby Blanket by Amy Solovay… please click the name of the pattern. The pattern is always linked to the name of the pattern. Hope this helps. Didn’t make it to the pattern either… Wth? @[1317712828:2048:Chris Pollock], @[1392576097:2048:Velda Lewis], @[100008307705814:2048:Peggy Burden], @[1774262263:2048:Deb Barnett], where it says :This Fast Easy Baby Blanket by Amy Solovay…. please click the name of the pattern : Fast Easy Baby Blanket. Hope this helps. It takes you straight to the pattern’s page. You need to scroll down till you see the Baby Blanket Pattern Instructions sub$#%&! @*le to get only the pattern, although the all article details the blanket. Is there a place where you can click next page? It may be simple, but it is beautiful! I love it April! I started one this evening, and it does go fast. Pretty s$#%&! @*ch pattern from such a simple combination. Never ever got to the pattern. I don’t believe there is a pattern. I don’t know what you are trying to sell but i’m not buying. Never could get to pattern..?? Where it says :This Fast Easy Baby Blanket by Amy Solovay…. please click the name of the pattern : Fast Easy Baby Blanket. to get to the pattern’s page, then scroll all the way down. Sarah,where it says :This Fast Easy Baby Blanket by Amy Solovay…. please click the name of the pattern : Fast Easy Baby Blanket. to get to the pattern’s page, then scroll all the way down. @[1370486867:2048:Pat Nichols],where it says :This Fast Easy Baby Blanket by Amy Solovay…. please click the name of the pattern : Fast Easy Baby Blanket. to get to the pattern’s page, then scroll all the way down. @[100004998333111:2048:Lynda B. Rodriguez] please click the name of the pattern : Fast Easy Baby Blanket. to get to the pattern’s page, then scroll all the way down. Been scrolling for 14 min and haven’t seen pattern yet ! I clicked on the highlighted word “source” and it took me right to the pattern. I then copied and pasted it to my crochet file. Hope this helps someone. This is the linen s$#%&! @*ch I brought the pttern last Tuesday. Gwen, Where it says :This Fast Easy Baby Blanket by Amy Solovay…. please click the name of the pattern : Fast Easy Baby Blanket. to get to the pattern’s page, then scroll all the way down. I tried to get to the pattern and ended up shutting off my computer because of it downloading ads and saying I had a virus… grrr! Denise, where it says : This Fast Easy Baby Blanket by Amy Solovay is suitable for either boys or girls… please click the words: This Fast Easy Baby Blanket . The pattern is always linked to the name of the pattern ( first letter capital always for the name.) Hope it helps. @[1544363181:2048:Carol R Haddon], where it says : This Fast Easy Baby Blanket by Amy Solovay is suitable for either boys or girls… please click the words: This Fast Easy Baby Blanket . The pattern is always linked to the name of the pattern ( first letter capital always for the name.) Hope it helps. @[100004995153176:2048:Debbie Akers], where it says : This Fast Easy Baby Blanket by Amy Solovay is suitable for either boys or girls… please click the words: This Fast Easy Baby Blanket . The pattern is always linked to the name of the pattern ( first letter capital always for the name.) Hope it helps. @[100007043320895:2048:Susan Sweat], where it says : This Fast Easy Baby Blanket by Amy Solovay is suitable for either boys or girls… please click the words: This Fast Easy Baby Blanket . The pattern is always linked to the name of the pattern ( first letter capital always for the name.) Hope it helps. I love this patter! it really does work up quickly. Sharon, where it says : This Fast Easy Baby Blanket by Amy Solovay is suitable for either boys or girls… please click the words: This Fast Easy Baby Blanket . The pattern is always linked to the name of the pattern ( first letter capital always for the name.) Then scroll down . Hope it helps. @[1366613834:2048:Kimberly Shouse Cater] thought you might like this. Cannot find pattern but I would love to make. Ca someone just write the pattern out please! Can someone write the instructions please. Can’t find pattern! Want to make this, looks so pretty. Thanks. Carmela,where it says : This Fast Easy Baby Blanket by Amy Solovay is suitable for either boys or girls… please click the words: This Fast Easy Baby Blanket . The pattern is always linked to the name of the pattern ( first letter capital always for the name.) Hope it helps. @[1240958476:2048:Carmela], where it says : This Fast Easy Baby Blanket by Amy Solovay is suitable for either boys or girls… please click the words: This Fast Easy Baby Blanket . The pattern is always linked to the name of the pattern ( first letter capital always for the name.) Hope it helps. @[100000654372662:2048:Lollie], where it says : This Fast Easy Baby Blanket by Amy Solovay is suitable for either boys or girls… please click the words: This Fast Easy Baby Blanket . The pattern is always linked to the name of the pattern ( first letter capital always for the name.) Hope it helps. Deborah, where it says : This Fast Easy Baby Blanket by Amy Solovay is suitable for either boys or girls… please click the words: This Fast Easy Baby Blanket . The pattern is always linked to the name of the pattern ( first letter capital always for the name.) Hope it helps. @[1149412273:2048:Wendy Holub Scarborough], i copied this one if you want.. I clicked on the highlighted Fast Easy Baby Blanket, scrolled down to the pattern, highlighted the instructions, copied and pasted the pattern to a word doc, saved. Also, copied a pic of the blanket and pasted to my doc. Going to make the blanket, later. Good pattern. @[100002510330790:2048:Sandra], where it says : This Fast Easy Baby Blanket by Amy Solovay is suitable for either boys or girls… please click the words: This Fast Easy Baby Blanket . The pattern is always linked to the name of the pattern ( first letter capital always for the name.) Hope it helps. I made one like this before. Found the s$#%&! @*ch in a book of crochet s$#%&!@*ches. I never could find pattern! @[100005666500291:2048:Caren], where it says : This Fast Easy Baby Blanket by Amy Solovay is suitable for either boys or girls… please click the words: This Fast Easy Baby Blanket . The pattern is always linked to the name of the pattern ( first letter capital always for the name.) Hope it helps. Pattie, where it says : This Fast Easy Baby Blanket by Amy Solovay is suitable for either boys or girls… please click the words: This Fast Easy Baby Blanket . The pattern is always linked to the name of the pattern ( first letter capital always for the name.) Hope it helps. @[1190270238:2048:ShJuanda Dianne Medley], did you get this pattern, I can’t seem to get it. @[100000051953824:2048:Pam], where it says : This Fast Easy Baby Blanket by Amy Solovay is suitable for either boys or girls… please click the words: This Fast Easy Baby Blanket . The pattern is always linked to the name of the pattern ( first letter capital always for the name.) Hope it helps. I did not found pattern for easy baby blanket? Marie, where it says : This Fast Easy Baby Blanket by Amy Solovay is suitable for either boys or girls… please click the words: This Fast Easy Baby Blanket . The pattern is always linked to the name of the pattern ( first letter capital always for the name.) Hope it helps. I have just started this pattern in blue. I so love it. @[100004998333111:2048:Lynda], where it says : This Fast Easy Baby Blanket by Amy Solovay is suitable for either boys or girls… please click the words: This Fast Easy Baby Blanket . The pattern is always linked to the name of the pattern ( first letter capital always for the name.) Then scroll down . Hope it helps. I couldn’t get the pattern to come up either. would love to try this. For all of you complaining about not being able to see the pattern. If you would have clicked on the part that says : “This Fast Easy Baby Blanket by Amy Solovay is suitable for either boys or girls and is made using only two crochet stitches: single crochet and chain stitch.” There is a hyperlink embedded on the words “Fast Easy Baby Blanket” takes you straight to the pattern site… here is the link in case you still can’t find it. Most I saw were not “complaining” merely stating they could not find the pattern. Actually I couldn’t find it either but I did see a few others telling HOW to find it and they didn’t try to insult those that had a hard time. @[100000983340654:2048:Becky] , where it says : This Fast Easy Baby Blanket by Amy Solovay is suitable for either boys or girls… please click the words: This Fast Easy Baby Blanket . The pattern is always linked to the name of the pattern ( first letter capital always for the name.) Then scroll down . Hope it helps. This is the craziest thing I have ever seen..!!! NO PATTERN..!! I have clicked in everything in the link and there is NO PATTERN..!!!! Weave 20 at a time, it is faster. @[1834636757:2048:Billie Jo Fortune],where it says : This Fast Easy Baby Blanket by Amy Solovay is suitable for either boys or girls… please click the words: This Fast Easy Baby Blanket . The pattern is always linked to the name of the pattern ( first letter capital always for the name.) Then scroll down . Hope it helps. Thanks Darla! I’m going to try it! Hate to tell you this, but when I clicked on this link I got a potential virus threat telling me to call a number to have it removed. @[1260714138:2048:Beverly], where it says : This Fast Easy Baby Blanket by Amy Solovay is suitable for either boys or girls… please click the words: This Fast Easy Baby Blanket . The pattern is always linked to the name of the pattern ( first letter capital always for the name.) Then scroll down . Hope it helps. I got the pattern & bookmarked the page. I noticed the pattern calls for SC but in the video she is using DC. I’m $#%&! @*uming the pattern is written in UK terms. In UK terms, a sc is a DC in American terms. I can not seam to get the pattern to come up !!! Sorry but i never did find it,,,have to be away i just not seeing it. I can not bring up the pattern…..I can get the page and the story of the blanket but no pattern. @[100001024486427:2048:Nina], please scroll all the way down , where it says: Baby Blanket Pattern Instructions. It’s a short pattern. @[648791600:2048:Kim],where it says : This Fast Easy Baby Blanket by Amy Solovay is suitable for either boys or girls… please click the words: This Fast Easy Baby Blanket . The pattern is always linked to the name of the pattern ( first letter capital always for the name.) Then scroll down . Hope it helps. @[100004320752920:2048:Debbie], where it says : This Fast Easy Baby Blanket by Amy Solovay is suitable for either boys or girls… please click the words: This Fast Easy Baby Blanket . The pattern is always linked to the name of the pattern ( first letter capital always for the name.) Then scroll down . Hope it helps. all it is chain stiches across first row turn and do a dl, next chain do a sc and repeat till size you want , so easy been doing this foryrs . Won’t give me the pattern. Find everything else but the pattern. I made one in blue. It turned out very nice. Jennifer Wood Kerl, where it says : This Fast Easy Baby Blanket by Amy Solovay is suitable for either boys or girls… please click the words: This Fast Easy Baby Blanket . The pattern is always linked to the name of the pattern ( first letter capital always for the name.) Then scroll down . Hope it helps. Judie Erickson, where it says : This Fast Easy Baby Blanket by Amy Solovay is suitable for either boys or girls… please click the words: This Fast Easy Baby Blanket . The pattern is always linked to the name of the pattern ( first letter capital always for the name.) Then scroll down . Hope it helps. This is very pretty. how did you do the the center (grey and pink intertwined together)? I used the variegated baby yarn from Bernat, then white, then pink, white, variegated, white, pink….etc. Beautiful!!!! So Pretty. Lucky baby to have you made it. My blanket using this pattern and I also made a cute little hat to match. well, I’ve clicked on everything and still can’t get this pattern to come up. How do I get it? ok I give up. I CANNOT get this pattern at all. I have used this pattern for so many baby blankets and lap robes for the Veterans. A super way to use left over yarns making it into a stripped pattern. They are great – and warm using baby yarn or knitting worsted. Ann Reiman, where it says : This Fast Easy Baby Blanket by Amy Solovay is suitable for either boys or girls… please click the words: This Fast Easy Baby Blanket . The pattern is always linked to the name of the pattern ( first letter capital always for the name.) Then scroll down . Hope it helps. OMG! Precious Angel! <3 Thanks for sharing Beth! Do not click on any green print … that takes you to ads. The video is for another pattern using Double Crochet and changing colors. Can’t get the pattern please I need help. Can’t get the pattern. Disgusting when they do that. I tried doing this and it doesn’t give you the pattern. Debbie, where it says : This Fast Easy Baby Blanket by Amy Solovay is suitable for either boys or girls… please click the words: This Fast Easy Baby Blanket . The pattern is always linked to the name of the pattern ( first letter capital always for the name.) Then scroll down . Hope it helps. Nope it just takes you 2 more ads for more crocheted patterns that take you to more ads for more crochet patterns. Waste of time. I’m not able to get to the pattern either. Help! can’t get the pattern to down load. I hate when I see something I would like to make and either there is “No Pattern” or “It’s free and you can’t get it.” So frustrated with this. It looks like a pretty blanket but everytime I click I get some type of ad. No instructions. Too difficult to get the pattern. I gave up. Karen, where it says : This Fast Easy Baby Blanket by Amy Solovay is suitable for either boys or girls… please click the words: This Fast Easy Baby Blanket . The pattern is always linked to the name of the pattern ( first letter capital always for the name.) Then scroll down . Hope it helps. Kathy,where it says : This Fast Easy Baby Blanket by Amy Solovay is suitable for either boys or girls… please click the words: This Fast Easy Baby Blanket . The pattern is always linked to the name of the pattern ( first letter capital always for the name.) Then scroll down . Hope it helps. Maryanne, where it says : This Fast Easy Baby Blanket by Amy Solovay is suitable for either boys or girls… please click the words: This Fast Easy Baby Blanket . The pattern is always linked to the name of the pattern ( first letter capital always for the name.) Then scroll down . let me know please if it works for you! Wilma, where it says : This Fast Easy Baby Blanket by Amy Solovay is suitable for either boys or girls… please click the words: This Fast Easy Baby Blanket . The pattern is always linked to the name of the pattern ( first letter capital always for the name.) Then scroll down . Hope it helps. I tried everything the pattern does not come up. Please fix this so it shows pattern! Can not find the pattern no matter what I click on. Too bad you can’t get to the pattern!!!! I love this pattern. It is so simple to make but looks much more fancy. I had difficulty finding the pattern itself. I clicked on the author’s name and it came up. I thought I might try that one. I’ve got the pattern saved. I like a lot of the projects on this site but finding the patterns are BEYOND FRUSTRATING!! I must agree Carol I have learned to just keep clicking and probably joining ravely I believe that’s what they are called would probably help. I am a member of Raverly. I am super leary of having to click a zillion places just to get a pattern. All they are doing is gathering info they have no business seeing!. Fooey on them. Make it user friendly or I don’t need it. There- My vent for today!! 2. Under the picture of the project click on the words DAILYCROCHET. 3. Scroll to the bottom and go to page 12. 4. Under the picture if the project click where it says [free pattern]. There are some really nice patterns there. You just have to go on a treasure hunt to find them. It is RIDICULOUS having to spend all that time searching. Thank you for your efforts. I totally agree. I have decided to “unfriend” them. Yes the patterns they show are beautiful if they were really interested in giving us their patterns it would be easier to get to them. Just doing single ch would take a long time to do . Wouldn’t it?? The grit stitch works well for baby blankets as well! I made one for a close friend and it was beautiful! Definitely trying this! I crochet looser. Used an H for ch and G for work. Doubtful. Bernat baby blanket yarn, Q hook and single crochet. Works up soooooo fast. Please help! I love this afghan. For some reason I can’t find the pattern. Very pretty ! ! ! ! Karen, please read the directions below the picture in the post. Hope it helps! Doing this on my phone and it is not working. Thank you for the help. I am making this now, and it is the easiest pattern i have ever done..very pretty in verigated yarn..
Stacey Boruff Hatmaker I need a baby blue blanket by December??? I can’t get the pattern either. Thank you so much Karen Lara!!!! Debbie, please read the directions below the picture in the post. Hope it helps! Love this! Next blanket is going to be this pattern!! Pretty. Did you try the pattern I was using? Chain 126, first row all single crochet. 3rd ch from beg 1 double crochet, 1 single crochet. Skip st 1 dbl crocet, 1 single crochet. Skip stitch repeat to end of row. Chain 2 turn, 1 dbl, 2 single in first stitch. Skip one? repeat pattern to end, repeat pattern. Then decide on a border. Can’t get the pattern. Be nice if someone put the needle size and directions in the comments. Thanks. Is it double crochet or half dc? Beverly, please read the instructions below the picture in the post. Thanks! Sherrie, please read the instructions below the picture in the post. Thanks! Id love to get this pattern but I’m searching using my phone and can’t get to it! Help!! I copied and pasted the post, then printed it, the pattern is not in print form, not PDF either. Christina, please read the instructions below the picture in the post. Thanks! I did but still had problems! Stuningly beautiful! Thanks for sharing Christine! I cannot get the written pattern to open in the link. I love the border you did on it. Pattern please. Love the border also. What is the grit stitch. @ Melissa Hengehold Green I used size I. I looked it up on you tube, put in the search engine “How to crochet a Shell border. Hope this helps. Would like a copy of pattern, I’m mobile and it won’t go to the pattern to download. That link does have a lot of hoops to jump thru, try this link. I think it will take you straight to the pattern. This link will take you right to the pattern I think. A little easier to access. Pretty afghan , but where are the directions and how do you get them? It is so frustrating when you have to keep clicking and don’t get the pattern! I think just sc would be very boring and take forever. I’ve been making c2c baby blankets, made 9 in past month, just crocheting in the evenings. This is pretty though. Katie Price, here you go……. It won’t even let me see the pattern. Every time I click the link it closes the page. Made this blanket with 4 ply and think it is beautiful but, much to heavy as a baby blanket. Guess 3 ply would be better and more fluffy and baby friendly. I will try again as I do like the pattern. Links and pictures go to more links and pictures…no pattern, just ads? Can someone post a video? Between the top two pictures of the blanket it is highlighted Fast easy baby blanket in GREEN, click on those words for the pattern. So easy!! Can’t get the pattern 🙁 Just love this blanket. Open it with a computer, where you can print, or write it down . Go to the link where it came from and hold down the control key and hit the letter p at the same time should bring up hi pro.red to print from. Susan, the pattern is in the name of the pattern: Fast Easy Baby Blanket, and in the links at the end of the article. Click the name of the pattern then scroll down below the video untill you see the Baby blanket instructions title.Hope it helps. Beautiful pattern. Your instructions and introduction are so well written and answer almost any question one might have about materials used. Wish all patterns would be so thorough. Thank You! Can hardly wait to try this; but plan to make it as an adult lapghan. Can someone share a link that actually works. Thank you. i have made it and turned out lovely..thank you! They have this course at Butte Colledge its call advanced under water basket weaving 101 Ha Ha. Will try, thank you so much. I never saw the pattern. Just saw what you will need. Wilma, the pattern is always linked to the name of the pattern. In this case, please click Fast Easy Baby Blanket words. Hope it helps! Looks like a therma blanket. I like that is there a pattern? I think this is the stitch I’m working with now but plan a large trim for it for an adult……used the bigger size and with Aran..but the contrasting trim will be a brownish heather. Where is the pattern? I checked on the site provided, but I did not see it. Kathie, the pattern is in the name of the pattern: Fast Easy Baby Blanket, and in the links at the end of the article. Click the name of the pattern then scroll down below the video untill you see the Baby blanket instructions title.Hope it helps. Beatrice, the pattern is in the name of the pattern: Fast Easy Baby Blanket, and in the links at the end of the article. Click the name of the pattern then scroll down below the video untill you see the Baby blanket instructions title.Hope it helps. Vickie, the pattern is in the name of the pattern: Fast Easy Baby Blanket, and in the links at the end of the article. Click the name of the pattern then scroll down below the video untill you see the Baby blanket instructions title.Hope it helps. Sherrie, the pattern is in the name of the pattern: Fast Easy Baby Blanket, and in the links at the end of the article. Click the name of the pattern then scroll down below the video untill you see the Baby blanket instructions title.Hope it helps. Crissy, the pattern is in the name of the pattern: Fast Easy Baby Blanket, and in the links at the end of the article. Click the name of the pattern then scroll down below the video untill you see the Baby blanket instructions title.Hope it helps. Rose, the pattern is in the name of the pattern: Fast Easy Baby Blanket, and in the links at the end of the article. Click the name of the pattern then scroll down below the video untill you see the Baby blanket instructions title.Hope it helps. You’ll have to show this to me sometime. It’s VERY pretty. How can I get the pink baby blanklet to crochet ? What hook size did you use? The instructions just state, larger-than -usual. Naomi Schonely could you maybe teach me some time? I have tried so many times to find this pattern & still to no avail. Don’t say free if you are not going to make it easy to get to. This pattern never loads for me. I click on the link and nothing happens…..I’ve tried on my phone and tab,et. Linda, the pattern is in the name of the pattern: Fast Easy Baby Blanket, and in the links at the end of the article. Click the name of the pattern then scroll down below the video untill you see the Baby blanket instructions title.Hope it helps. I don’t seem to access the pattern….have tried several times. I use similar to do any chevron/ripple. so easy..
Is this the sc, ch 1 same as above pattern?? I couldn’t download it but I copied the pattern and pasted it in a document. Do you have an email address? If so, send me a private message. For anyone wanting to skip the hassle of trying to find out what the stitch is just google seed stitch. There you will find links for it. Pam, I figured it out!!! I’m so excited! Sure wish there was a pattern like this in knit. I can not crochet. Wanda, the pattern is in the name of the pattern: Fast Easy Baby Blanket, and in the links at the end of the article. Click the name of the pattern then scroll down below the video untill you see the Baby blanket instructions title.Hope it helps. Patricia, the pattern is in the name of the pattern: Fast Easy Baby Blanket, and in the links at the end of the article. Click the name of the pattern then scroll down below the video untill you see the Baby blanket instructions title.Hope it helps. I knit for premature babies and this blanket would be ideal. Unfortunately, for some reason I can’t download it. I can’t even see the pattern to hand write it. Have you any advice for me please. Made this in light pink and it is beautiful! Anne, the pattern is in the name of the pattern: Fast Easy Baby Blanket, and in the links at the end of the article. Click the name of the pattern then scroll down below the video untill you see the Baby blanket instructions title.Hope it helps. Found it and wrote it down. My daughter is having a girl in April would love to try and make this…for her..
Adorable set Yvonne! <3 Thank you for sharing! I’ve made this pattern for years, but most of the time I do it in hdc instead of sc. Works up nice and looks great. I’m having trouble getting the pattern too. Get ads, and have to download to something I don’t want to click on. Does this pattern have a lot of holes in the design?? Any help would be appreciated. thanks. Marlene, the pattern is in the name of the pattern: Fast Easy Baby Blanket, and in the links at the end of the article. Click the name of the pattern then scroll down below the video untill you see the Baby blanket instructions title.Hope it helps. My copier doesn’t print so I would really be pleased if someone would copy this for me like maybe Jo please! I could not get the pattern to load. went to the end of the article and still cannot get the pattern. Anyone would love one of them. I made this afghan using the same stiches around 3-4 years ago. Mine came from a different source. The dark purple border was my idea. Easy pattern. Can’t find the darn pattern and when I start clicking on the 35000 links included my anti virus tells me this is corrupt. Too bad, I’d really like the pattern but not at that price. I have a baby blanket started in light blue now. Love this pattern. Anyone want to knit a couple of these? Gotta a price ready? No matter what I did I couldn’t find the pattern. Thank you-now that I see it–do I have to copy and paste to WORD to be able to print off instructions/?? thnaks. Still having problems==found instructions once, now can’t find directions again. Was hoping for an EASY way to print off instructions. I’m feeling very frustrated.!!!! wow, i crochet and this is beautiful. could not get a pattern on page 2. is this a scam. Alli Anderson, could you print this pattern for me? clicked on link and virus warning came up! I’ve made this blanket twice, in different colors. Definitely one of the easiest blankets I’ve ever made! Kayla Lawrence this is a very easy blanket!!! I’m new at it could you explain it to me in the easiest way please?! Do you know how to read patterns? The basic pattern stitch is CH 1, SK 1, SC in next CH. Very pretty and easy too!! Thank you!! Ummm, I made one out of 100% cotton #4 Lilly’s Sugar and Cream. It turned out very stretchy. Could be blocked, but still not sure it will ever hold up its square great. I checked, I did all the stitches right, even in the turns, just the nature of the cotton. I could have used a smaller hook, but again then more struggle for my hands ( I avoid that). Will probably be the babies favorite blanket! Do u crochet, Beverly J Oliveros? Not a lot. Need to take a refresher course. It has been a long time! like how the video in these directions is actually a different pattern. was that intentional or a mistake? I attend a Crochet/Knotting group Cups Crossgates. Have enjoyed the patterns u share. I am doing this pattern right mow, taught my neighbor now we are both breezing along. Very easy pattern and goes quickly. Jennifer Steagall OBrien, have you made this baby blanket? I haven’t either! I’m thinking of making Tim an afghan for his birthday in June, even though he won’t need it until next November or December! I’d like to try that baby blanket — next month! I’ve made several of these and they’re gorgeous. This stitch makes great scarves too. I could never get the directions to this. Can anyone e share please? i cant find the pattern. just takes me from one page to another …. anyone find it? I MADE THIS ONE. LOVED HOW IT TURNED OUT. This makes a beautiful Baby Blanket. I have made several using this pattern. Simple also. Wendy where is says “This Fast Easy Baby Blanket by Amy Solovay… please click the name of the pattern. The pattern is always linked to the name of the pattern. Hope this helps. Diane, where is says “This Fast Easy Baby Blanket by Amy Solovay… please click the name of the pattern. The pattern is always linked to the name of the pattern. Hope this helps. I am making this but I think its not very wide. Its says 5 stitches makes or equal 1 inch. I measure the three on top with the two from the bottom row. was I wrong? Love the little blankets. But finally reaching the right page for a pattern is not worth the effort. Ads by the dozens to fight through. I would pay a fee before I’ll spend anymore time fighting the crap. Can some please send me the pattern or mail it to me? Every time I click it. It goes right back to the picture of the afghan. Thank You for anyone to help me. I did that and got a page that would not close and said call this number your computer has a virus. total pain. Had to shut off the computer and hope it wasn’t messed up. I am in California… probably can’t come to your office. Too many ads, can’t get to pattern. Please just post baby blanket information, no ads, no going here and there! it is a very easy pattern….i made several of these. it looks like a thermal blanket…. Row 1: Place a safety pin or other marker in the first ch from your hook. sc in 3rd ch from hook. [ch 1, skip next ch, sc in next ch.] Rep across entire row. Ch 1, turn. Rows 3 and Up: The rest of the rows are all exactly the same as row 2, with one minor difference: at the end of the row you’ll work your last sc st into the turning chain of the previous row. Rep this row until the baby blanket is the length you want it to be. When you are satisfied that the baby blanket is the length you want it to be, cut the yarn leaving an extra long length of yarn (around six inches long or more.) Thread your tapestry needle using this end of yarn and use the needle to weave the loose end of yarn into the blanket. Repeat with any other loose ends you may have hanging from the blanket. I think this pattern is nice without any edging at all, especially if you are making a blanket for a baby boy. Either way, the design is chic and simple, and an edging is not a necessity. However, you can feel free to add an edging if you want to. If you decide to add an edging, here are some free patterns you can look at. Please note that these edgings may need some adapting to work well with this blanket; the stitch pattern used for the blanket pulls in a bit more than usual. Krys Johns. Thank You so Much just got this! Like WOW!! Look above in the comments under Donna Ingram. Someone provided the directions in a reply to her. The directions are above in a reply to Donna Ingram’s comments. I got a virus when I clicked on your site…. I’d like to get yarn for this before vacation. Is this an easy stitch you can show me? Bobbie, I need a pattern for a lightweight blanket…would this one work? Bobbie, I need a pattern for a lightweight baby blanket. Would this one work? I can’t find the pattern. Clicked thru 3 links and still only got to the needed materials. No pattern there either. I finally found it last night by clucking on show full story. Didn’t even see that link amid all the ads. Just finished one. Easy pattern. Thank you for sharing. Vickie Hawkins Leitch, the pattern is in the name of the pattern: Fast Easy Baby Blanket, and in the links at the end of the article. Click the name of the pattern then scroll down below the video until you see the Baby blanket instructions title.Hope it helps. I am giving up trying to get this pattern. Been trying for days and followed all the comments trying to help me! Goodbye…not worth the trouble! Debbie Hughes what is c2c? And what do you do at each end? I have not been able to find pattern ???? It would be nice to find the pattern and not guess which hyperlink to click. There are times simple can actually be stunning. Thanks for the tag. Btw, how/why are you following a crochet site? I really don’t know JAL..It just came up on my news feed..Must of been an offspin of another site I was on..I am trying to think of a funny site without being rude,,, but nothing is coming to mind…So no joke for you today. I used the Bernat baby blanket yarn and this pattern works up fast with the thick yarn! Lovely! What Stitc is this? I’d like to find it on YouTube (I’m horrible with patterns). I need to SEE it being crocheted. Is there a video somewhere? Would you email me the link to the pattern? Cdabis@hotmail.com. ? I didn’t know you crochet, Lesley. I’d love to learn to crochet. I made a few granny squares a few years back. I need someone to show me. Instructions don’t do it for me. Love the border on this!! Don’t care what u tell us….cannot get the pattern……get crap ads. I could not find the written pattern in the link? Can it be reposted? it would be nice if they would have the pattern available, instead jumping through the hoops and still not get the pattern.! I just click on the link above lol and that’s all it took. I’ve made this one and one more. You’re not helping the situation!!!! Linda Ferrell-Henson, do you know about this? Or is this the one you make? I’ve looked at this pattern but haven’t made one yet. Oh, that is so pretty. We should make this…then you could work on it over the winter… It is cute! I’ve also known this stitch as the moss or granite stitch. I’m using it for thermometer blanket adding a row a day. Color based on temperature high of the day. Lexi Round here is a great pattern. Works up easy and quick. Okay…what is the stitch called? I too cannot get the pattern. http://crochet.about.com/od/babypatterns/a/fast-easy-crochet-baby-blanket-for-beginners.htm this is the fastest way to get to the pattern. Rose Miller. the pattern is in the name of the pattern: Fast Easy Baby Blanket, and in the links at the end of the article. Click the name of the pattern then scroll down below the video untill you see the Baby blanket instructions title.Hope it helps. Angela Williams, the pattern is in the name of the pattern: Fast Easy Baby Blanket, and in the links at the end of the article. Click the name of the pattern then scroll down below the video untill you see the Baby blanket instructions title.Hope it helps. Ann Bendoraitis, the pattern is in the name of the pattern: Fast Easy Baby Blanket, and in the links at the end of the article. Click the name of the pattern then scroll down below the video untill you see the Baby blanket instructions title.Hope it helps. E Christina Dabis-Appleby, the pattern is not mine so I cannot email it to you, sorry. There are legal rights of copyright owner involved. However I can direct you to the designer’s site and as a rule to use daily crochet site, here it is: the pattern is in the name of the pattern: Fast Easy Baby Blanket, and in the links at the end of the article. Click the name of the pattern then scroll down below the video untill you see the Baby blanket instructions title.Hope it helps. Susan McFee Nobitz, the pattern is in the name of the pattern: Fast Easy Baby Blanket, and in the links at the end of the article. Click the name of the pattern then scroll down below the video until you see the Baby blanket instructions title.Hope it helps. Michelle Gitmed, the pattern is in the name of the pattern: Fast Easy Baby Blanket, and in the links at the end of the article. Click the name of the pattern then scroll down below the video until you see the Baby blanket instructions title.Hope it helps. Okay. Thank you. I’ll give it a try. I had forgotton I have made a shell border. I never did get the pattern. Why can’t you just send the pattern with the picture???? it would save us a lot of time looking for it. Kashkaani Aspen the pattern is in the name of the pattern: Fast Easy Baby Blanket, and in the links at the end of the article. Click the name of the pattern then scroll down below the video untill you see the Baby blanket instructions title.Hope it helps. Peggy James, the pattern is in the name of the pattern: Fast Easy Baby Blanket, and in the links at the end of the article. Click the name of the pattern then scroll down below the video untill you see the Baby blanket instructions title.Hope it helps. Nadine, you might like this blanket pattern. I wish I could find it among all the ads. Impossible. I wish I could knit or crochet. I’m left handed and my Grandmother used to try and teach me by I could just never get it watching her who was not left handed. What kind if stitch is this..it’s beautiful..
I’m working on my second one of these. Love it! Wow! I did the exact same border on my first one. Still working on making my second one. I love doing this easy quick way. Ive tried to get this pattern several times and have not suceeded. I think this is a poor site.. I even have a ton of baby weight yarn that will work perfectly. I gave up trying to get to the pattern :(. I love the looks of the blanket!!! Good job! Did you find the pattern? I tried to get this free pattern and was sent to many sites. Did you get it? I LOVE this pattern and the way it works up!!! I give it up. It’s beautiful, but it’sjudt not meant to be. i’ve been trying forthe past 3 weeks and page won’t load. Baby shower is gone by. Dang it!!! So sad I can’t get pattern. I would love to make 10 of them. Hattie Allen, save this one…it’s a good starter project we can use. May I share your picture? Sure. Let me find the pic that started this idea and I’ll post it. However it was a double crochet and felt the stitch they used would result in a super tall blanket. Even with single crochet, at 365 days, it will be 7 1/2 feet tall. I also added Royal blue to this thermometer for any days 100 or higher. I am an Area Coordinator of Binky Patrol a nonprofit organization that makes blankets, booties and hats for children and infants in need. I am in need of different patterns for these children. Thanks for this idea! I’m going to do this! How many cs did you start with? Mallarie-Patrick McCoy, do you mean for the width? I don’t remember as I started two at the same time. This one is about the width of a queen size. The other was the width of a cal King. Because of how tall it turns out, I would recommend going with queen size width. Can not get to pattern, tried 5 to 6 different ways!! It won’t load for me ??? I will be doing the same thing to mine as well! Thank you Wendy. I appreciate you posting the link. I’m experienced and I was getting pretty frustrated. Why can’t they just post the link in the first comment? Would be so much easier for everyone.